This time of the season, I’m getting a lot of younger hitters starting their turn before the stride foot hits the ground. I ask them if they throw a baseball or softball before their stride foot hits the ground? 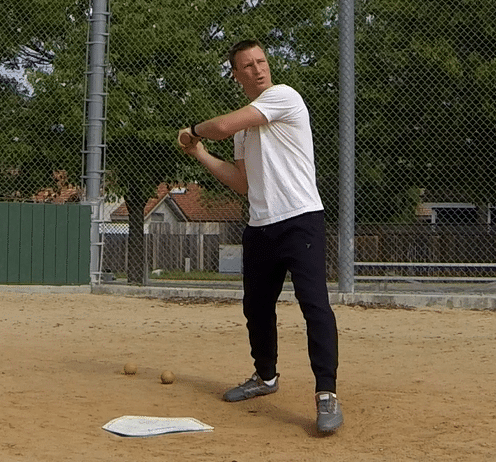 Why are these younger hitters starting their turn before landing their stride foot? Because of a flat barrel at or close to landing. I also called it a “bleeding barrel” in this post that analyzed Paul Goldschmidt’s swing. The biggest reason is because when the hitter flattens out the bat at or slightly before landing, it shifts the center mass of the bat behind the center mass of the hitter. As close to landing as possible. Paul Goldschmidt VIDEO: Bleeding Barrel - A Power Killer? Joey, I like the idea but I’m not sure about the whole thing (bigger picture)…Great topic…. Have you had a chance to look into the end loaded and balanced bats… I really hate balanced bats!!!! What say you? Hope all is well…. Djura, it’s all about feel for a hitter…I have my hitters train with both. Physics says an end loaded bat will have faster Ball Exit Speeds than a balanced one with all things being equal. I had thought that the flashlight was to point at the catchers feet. Is that incorrect? Yes Jay, but I’ve updated the drill using it this way to also take into account “hiding the hands” from the pitcher. Djura, I agree. One drill typically doesn’t work for all hitters. You’re dealing with primary feel, visual, or audible learning styles. Working with your swing using this drill, I could find a way to make it work keying in on your primary learning style. This drill didn’t work for us. If they are committing to the turn to early doesn’t that initiate from the bottom half? So how does forcing an upper body movement fix this? I have a hitter struggling with this issue. Great hitter but deals with alot of inconsistencies. I have been watching youtube videos for years. Ordered analysis, worked with local and online coaches and have not fixed this issue. I’m not going to continue spending money just to tinker away and have no improvement. Personally I think he is a momentum hitter and gets alot out of his stride. So when the front toe touches he is trying to slot it esrly to hit with that momentum. I’ve tried going heel up heel down etc.. tried this flashlight drill. Even did it at night with a real flashlight. Sorry for the frustration. Try lowering the hands, and not letting the top hand thumb get above the armpit level all the way to landing. Have you tried Finger Pressure? This seems to fix most of my racing back elbow hitters. I’m sure this hitter initiates from the bottom half when throwing, but the problem is he does it in reverse when hitting. You have to get the hitter to focus on fixing the movement with process, not focusing on his outcomes early on. In other words, if he swings and misses but follows the process, then that’s an “A” swing. If he hits a fiery hole through the back of the net but ignores the process, then that’s an “F” swing. Please contact me directly and I’ll cancel/refund your order.